Who knew after seventeen years as a Drama teacher I could still feel stage fright? (Not from being on stage, as I will explain…) In that time I’ve directed and produced somewhere around thirty shows, but my experience in drama goes beyond that to involvement in church productions, practice teaching, and my role as a playwright. Yet it never ceases to amaze me that I still lea rn new things with each production. 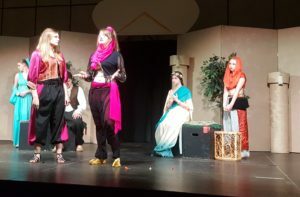 Recently my extra-curricular group, the ‘KodiActs’, performed one of my published plays called ‘Ali and the Magic Lamp’. It’s a twisted parody of the classic tale where Ali is a skateboarding teenager and Genie has attitude to spare. The troupe performed four shows over a two day period and by all accounts it was a smashing success. The audience had no idea the anxiety that took place before the show or the somewhat scary turn of events backstage during the last performance. Of course, I’ve seen it done dozens of times, but this time I was actually the foreman, showing students how to bolt together a thirty-two foot truss and then raise and mount it above the stage. I had to demonstrate how and where to screw all the stage flats together to make the backdrop, making sure the twelve foot centre archway didn’t come crashing down in the process. I had to help string electrical cable and hang heavy (and expensive!) stage lights, although I did find a brave volunteer to climb the ladder who was also stronger than I, to make sure they were clamped in place and wouldn’t come loose during the show. In all, it was a fantastic learning experience for me. it showed me that I could do this part of the job. I’d often wondered how I would manage without my right hand man there to help me, and now I know I can do it. It gave me a new sense of accomplishment. I was so proud of how my other young actors handled things. They’ve been trained by the old motto, “The show must go on,” so her scene partner ad-libbed his way through the initial awkwardness and I immediately called for lights and music. When I got backstage, she was out cold. With the help of another teacher and a couple of other actors we managed to get her off the stage and out into the foyer. 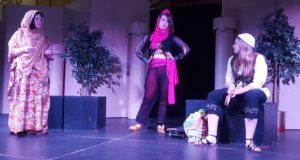 Her parents were called immediately, (we have a contingency plan in place since the incident last year) and the rest of the play went forward with her understudy completing the play. Although there was a longer than normal scene break at one point, some of the audience didn’t even know what happened. I mentioned it at the end of the show and the student in question got a nice round of applause. Meanwhile, she had been ‘out’ for almost five minutes in total. Her parents took her to emergency and she was disoriented when she came to, but she was otherwise alright. This was another first for me. I’ve had actors sick and throwing up backstage; panic attacks, last minute substitutions, and as I said, one similar incident with a seizure (but at least it was off stage!) It just goes to show that even when you think you’ve seen it all, something new is bound to happen. Like I said, even this old dog can learn a few new tricks. A seizure is definitely a first for me as that sort of thing goes. My father’s epileptic, but of a kind that’s managed with medications. He hasn’t had seizures since he was a kid.